In The Complete Beatles Chronicle, English author and historian Mark Lewisohn said this about Beatlemania: “Why the mayhem started, and why it was necessary to those causing it, will forever remain a mystery, defying social psychologists and historians then as now”. Psychologists, sociologists, and historians may not shed much light on the coming and going of mass adoration of performers and groups like the Beatles. But a socionomist can. In one of our most-read articles, Elliott Wave International and Socionomics Institute founder Robert Prechter uses the Beatles as a case study of how social mood drives the popularity (and unpopularity) of public figures. A brief history of the Beatles as it relates to our best sociometer—the stock market—should help elucidate the case for the socionomic regulation of the popularity of famous people. The main general point of this review is to show that the radical shifts in the Beatles’ fortunes followed quite precisely the radical shifts in the stock market’s fortunes. Contrast the years of struggle and frustration, ending at the bottom of the bear market of 1962, with their career-making breakout when the trend turned up. Contrast the spectacular rise in their fortunes as the stock market rose from 1963 through 1965 with the string of stunning setbacks during the bear market of 1966. Observe that the rally of 1967-1968 brought a return to success, but, being a bear market rally, not a bull market wave as was 1963-1965, it had plenty of stresses and negative aspects. Finally, contrast the events attending the 1967-1968 stock market rise with those of the 1969-1970 bear market. 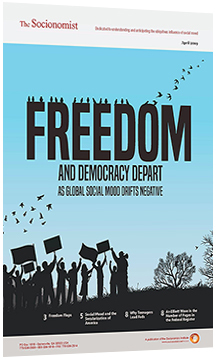 The changes in their experiences are so stark—and the role of society so obviously important—that one cannot fail to see the trends of social mood at work. Figure 1 summarizes this information. For those interested in getting a more intimate flavor for each of these periods, as well as for those interested in the story itself, a detailed timeline follows. Everything the young members of the Beatles did with respect to the band’s career beginning in 1957 but especially from the summer of 1959 forward laid the groundwork that allowed them to benefit from the watershed event that came in October 1962, namely, the change in social mood from negative to positive at Primary degree. Perusing the events of this initial five-year period gives one a feel for the shortcomings, roadblocks, difficulties, vacillations and failures that dogged the band’s efforts through the end of the Primary wave 4 correction in the stock market. In the formative years through 1960, the band members were usually so broke that they would argue over whether to pay extra for jam on their toast. They could rarely afford to buy records, so even as late as 1961 they were copping chords and lyrics of songs in the listening booth at NEMS record store. This period breaks into three sections: one year of initial activity (1957-58), one year of inaction (1958-59) and three years of concerted effort (1959-62) against the headwind of a bear market. Figure 2 includes the first two periods; Figure 3 depicts the third. Early March 1957: John’s friend George Lee suggests starting a skiffle band. John and he assemble some friends, including Pete. Originally dubbed the Blackjacks, they change their name to the Quarry Men. In the rest of this 38-page article, Robert Prechter uses five more figures to illustrate how social mood regulated the Beatles’ popularity throughout the rest of their career, including Beatlemania from 1962 to 1966, low production and controversy in early 1966, a new band persona from late 1966 to late 1968, and the group’s internal conflicts and ultimate dissolution from late 1968 to 1970. Prechter also reviews events in the aftermath of the band’s breakup, such as a resurgence in the Beatles’ productivity and popularity during the stock market rallies of the 1990s and 2000s. *Bonus: Learn how the numbers associated with the Beatles’ career illustrate a Fibonacci influence. Also, discover how the career ups and downs of bear-market hero John Denver contrasted with those of the Beatles.